Another week, another wonderful Mojo Monday. To all you circle card diva’s I salute you, this was a difficult card for me to piece together. 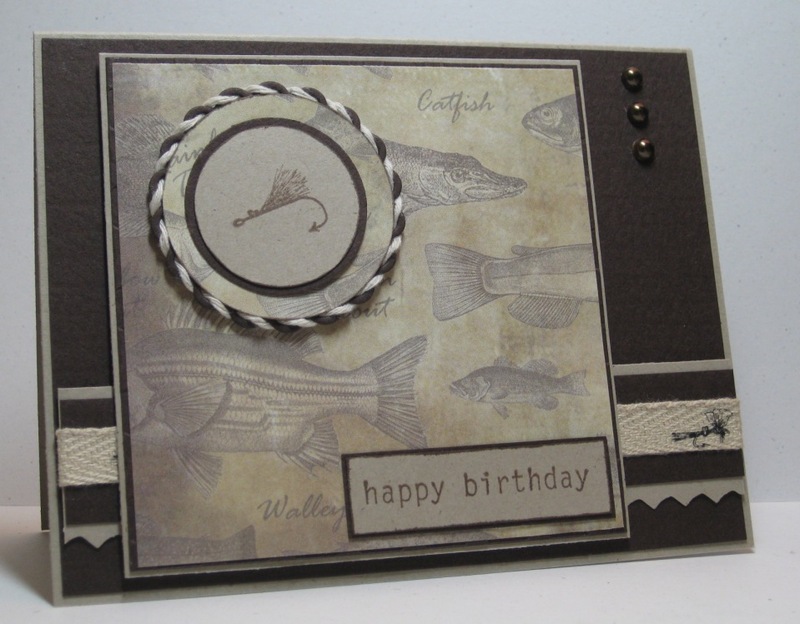 I started with scalloped design created by my sister Barb Derksen to create the card shape using Sure Cuts A Lot software and my Cricut, I love that software more each time I use it. I used my Dill Blossom designer paper, I love it but truthfully it was sitting on the craft table and well it worked :). I added some small extras like using my Cuttlebug to emboss the green strip and thin iridescent twine on the ribbon to add a little glitz. Supplies: Cream card stock, Designer Paper-S.E.I, The stamps of Life-flowers2share, Cuttlebug- Leafy branch embossing folder, multiple Stampin’ Up! 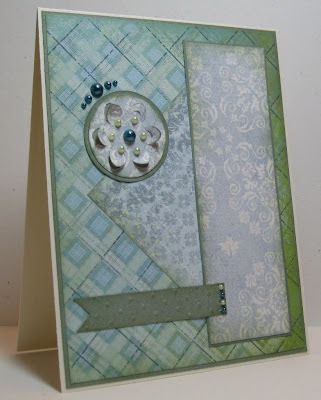 circle punches, Spellbinders-Lacey Squares, misc ribbon and twine, Kaisercraft pearls. The weekend seemed to go way too quickly. I had great plans to make cards but in the end only managed one. I used this weeks Mojo Monday sketch to do a Mothers Day card. All designer paper is S.E.I-Dill blossom, I was not sure what I would use for the focal point and ended up doing a double flower that I used my Slice to die cut. The flower is double layered and pop-dots provide multiple dimensions. 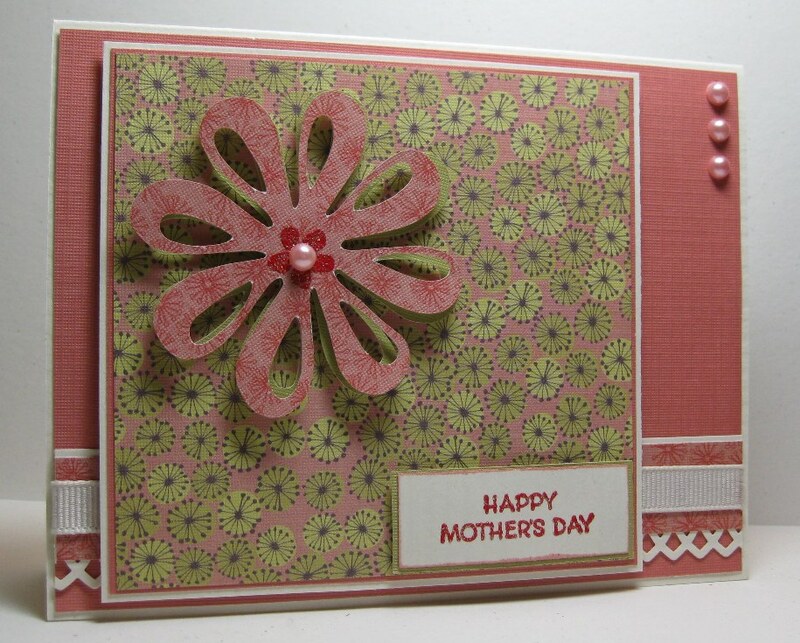 Supplies: Cream card stock, Designer Paper-S.E.I, Slice-Think Pink Design card, Stampendous-Happy Mothers Day﻿, Recollections Pearls,Stamp-n-Stuff Red Dragon embossing powder, Martha Stewart-Arch Lattice Edger Punch, misc ribbon. Happy Friday. I am very glad to be heading into the weekend, and there is still lots of snow to enjoy for tomorrow..hopefully. Victoria was in a little snow globe this week, my area received close to or if not a little more than a foot of snow. There is always havoc here when it snows, our city just does not have the resources to get it all cleaned up. It won't last for long though. A quick card today. The most time consuming part of this card was the butterfly, I used my Tombows on a piece of plastic and misted it with water mixed with perfect pearls to get colour that matched the DP and add shimmer. I finished with pearls for the body. Supplies: Blue cardstock, Designer Paper-Memory Box, Spellbinders Shapeabilities-Butterflys Kaisercraft pearls, Sheer creations ribbon. Happy Monday :). Just a quick post for Mojo Monday. I think the supplies list is going to be the longest part of this post. I love this sketch, it has a very feminine feel to it though, and well I was in need of something masculine. I think it turned out ok though. I will have to try a girly card later this week. ﻿I don't lack for fishing stamps or Designer Papers I think this is the last one I have of the Karen Foster designs though. Supplies: Kraft and brown cardstock, Designer Paper- Karen Foster, Spellbinders-Lacey Circles, misc circle punches, Magenta-Fly stamp, Stampin' Up!-Happy Birthday, Fiscars-Dragonback paper Edger, misc pearls, fly ribbon and twine. Quick and simple today ladies :) and one day closer to the weekend. Clean and simple is not easy for me, so I am trying to do a few more of them to get some practice. 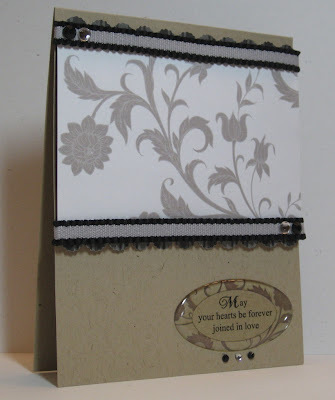 Supplies: Natural White cardstock, Designer Paper-Fancy Pants-Emma’s Garden,Stampabilities-Thanks, Sizzix-Buttons #4, Sheerly Yours Offray ribbon, Kaisercraft pearl. Ok, I should have posted this earlier but in truth this was a last minute creation on Saturday. I had a card made for my husband for weeks, I always tend leave the one for my son till the last minute. Procrastination is great isn't it. I had embossed the My Valentine sometime in the past 3 years, yup 3 years. I make mistakes or something does not fit and I save it, I saw this peaking at me over the edge of my shelf and decided to build a simple card around it. The tan cardstock comes embossed with dots. I used a large circle punch that magically fit to cut out the embossed image, I then added a red Lacey circle as a background. I used my very rarely used Dragonback Fiskars paper edgers scissors on both layers. I added some thick red ribbon. I finished with a Spellbinders Ladies fashion buckle, if you look close it has hearts. 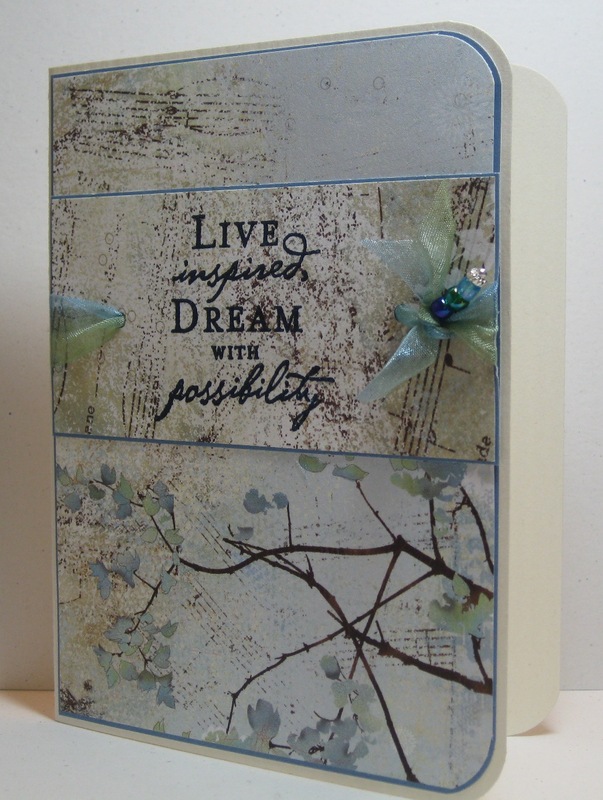 I heat embossed it with clear embossing powder for a glossy look. Supplies: Cream, red and tan cardstock, GStudio- Valentine, Spellbinders-Ladies Fashion Buckles and Lacey Circles, Ranger-red embossing tinsel, misc red ribbon. Happy Valentine’s Day. My husband and I did a mini celebration yesterday, which usually consists of swapping cards and a nice family dinner. It is also Mojo Monday. I am feeling under the weather today, maybe that accounts for my very green card. My little 6x6 stacks of Memory Box papers are sitting on my desk, so they were the first thing I grabbed when considering ideas in my head. I did not realize how green it was till I had it all put together. 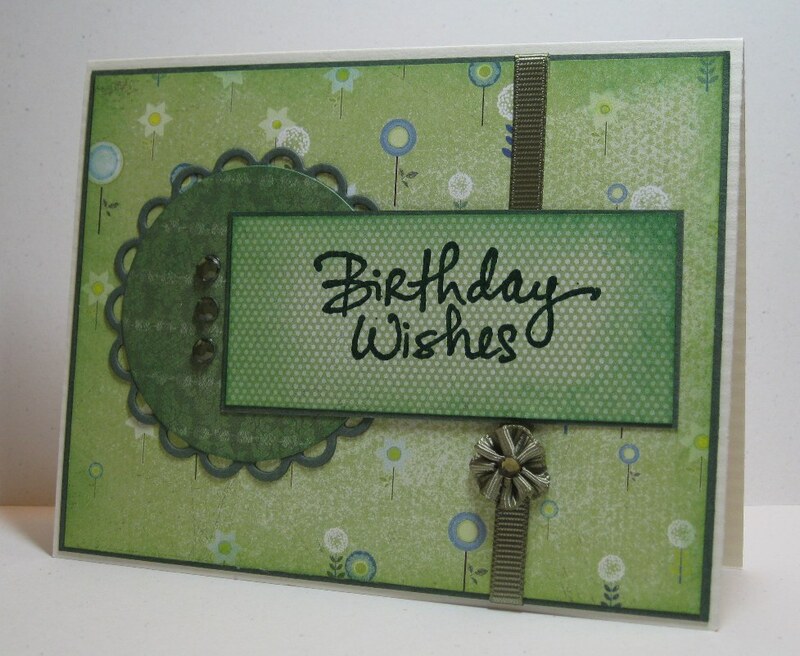 I edged all my paper bits with Evergreen Versa Color, I embossed Happy birthday with Forest Green embossing powder. I glued all my layers then tried unsuccessfully to make a bow with grosgrain ribbon for 20 mins before I decided to make a flower out of it. That was no easier but I did make it happen. I topped it with a Hero Arts Gem, which I also used inside my circle. Supplies: Cream and green cardstock, Designer Paper-Memory Box, Spellbinders Nestabilites Standard and Lacey circles, Stamp-it- Birthday Wishes, Hero Arts-Gems, Grosgrain Ribbon, Stampin’ Up- Embossing powder. Another quick post, I am still making my way through my Card a Day book, using the images as my sketches. I love this Memory Box paper, no surprise there. I stamped the sentiment with Versamark and used a navy embossing powder. I used a jewellery stem and added coordinating beads, I used a brad to secure it. 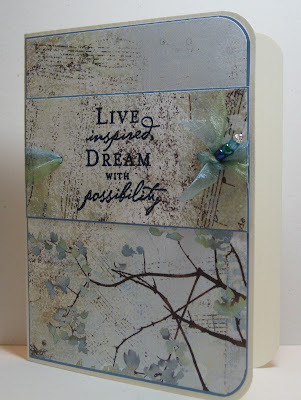 Supplies: Cream and blue cardstock, Designer Paper-Memory Box,Close to my Heart-Live Inspired,Shear Creations, misc beads. I found this great software today, I was looking for some tutorials for my Cricut and stumbled across a one from Scrapping Table referring to a cool software. Sure Cuts A Lot 2, uses all sorts of free fonts and dingbats in place of Cricut Cartridges. I only cut out random words, letter and shapes today, but I can't wait to make some cards with the results. I think this might just save me $$$. Just a quick post today for Mojo Monday. Supplies: Cream and green/blue cardstock, Designer Paper-Memory Box, EK Success flower punch, Recollections- Pearls. A quick second post for today, and a second card. It took me forever to trim a straight line with the Japanese rice paper, in the end it was a little off but the mix of black and gold layers of cardstock hides it well. I have the asian coin glued onto a another layer of rice paper and black cardstock to have it popped up. I used my Derwent Watercolour pencils to color the image and I added some Diamond glaze to the candle flame and wax to give it a glossy look. Supplies, Ivory and black and gold cardstock, Designer Paper-Japanese rice paper, There She goes- The Journey, Spellbinders-Scalloped Circle, Circle Punch, Asian coin embellishment. Enjoy a Chinese sesame ball with red bean filling (oh so nummy) today :) I know I will. Happy Anniversary to my sister Barb and her husband Miles. Have a great weekend of Anniversary romance J.
I found this little Mini scrapbook album in a dollar store a couple of years ago, it has paper, rub-ons and embellishments. I used a really thick ribbon, and Iended up having to put a small piece of cardboard in behind the decorative panel so that it would be supported. I finished with some Hero Arts gems, and added Happy Anniversary on the inside. Also we have added another blogger to the family. Welcome Neti, I look forward to all your wonderful posts. Now if only we can talk Samantha into joining us. I found this wonderful paper pack at Michaels this weekend. S.E.I Dill Blossom, I just had to use it for this weeks Mojo Monday. I used Rangers Antique Linen- Distress ink to edge the two layers of designer paper, I used my Cuttlebug to die cut the buttons using Sizzlits buttons. I added pop dots to the back of the buttons and added glitter to the tacky side of the popup dots that showed through the button holes. If you look real close at the picture you can see the glitter sparkle. I finished using my Slice to cut out Happy. Supplies: Cream cardstock, Designer Paper - S.E.I, Sizzlits button #1 and #4 die cut, Slice- holiday Expressions-Happy, Glitter Ritz-Green mist glitter, misc popup dots. Mojo has become a family affair, check out these blogs too my sister Barb's as well as my sister-in law's Judy.